VHS tapes were never perfect. They often broke, got stuck in the VCR, or didn’t want to rewind. Whatever the problem is, it usually happens the the tape you care most about. If you’ve ever had a VHS tape that wouldn’t play, rewind, or fast forward, you might be able to fix it by manually rewinding your VHS tape. You will need to fix this issue if you ever wanted to do a VHS to DVD transfer, or even watch the tape again. Tapes usually get stuck when one of the reels gets caught on one of the cassette mechanisms, or there is a crease or foreign object blockage in the tape itself. Here’s how to easily unwind a VHS tape. 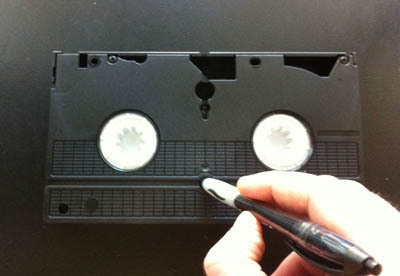 The first step is to try to manually rewind the cassette. You may notice that the white reels will not turn in either direction. To accomplish this, you’ll need to press something thin like a paper click or pencil into the socket in the back of the VHS tape. There is a small button here that when pressed, will unlock the reels so that they can be turned in either direction. Try turning the reels a few times with either your fingers, or using scissors like I do. Hopefully, the reels will begin to turn and with any luck you’ll be able to see what’s causing the blockage. If you’re still unable to turn the reels after pressing the button on the back of the tape, you’re likely going to have to open the tape up to take a look inside. This is usually a case of a broken internal mechanism, or foreign object blockage. Unscrew the screws in the back of the cassette to separate the two shells. Check here for a guide on how to do this. Once you separate the tape, try to locate the source of the problem by turning the reels, or lifting them out and inspecting them. If you are experiencing a broken internal mechanism, it’s highly recommended you transfer the tape to a new cassette by following the VHS repair guide. This entry was posted in Video Tape Transfer and tagged manual rewind, repair vhs, rewind vhs, unwind vhs, vhs. Bookmark the permalink. Wow! It is 3:30 AM and I cannot believe I found this solution to my problem. I will be attempting to do this when I wake up. GOod night and thanks. I will let you know how I make out. Great! I’m glad to have helped out with your video tape issue! I do not know vhs terminology for problems with viewing them. I have a vhs tape that I “think” is a tracking issue. Picture jumps up/down continuously from beginning to end.Sound is all there,but with some slight and infrequent distortion throughout. This does not occur with any other vhs tape I view,leading me to assume it’s this specific tape.Any idea’s on how I could attempt to rectify this? If there is not a possible solution for me,an amateur,is this something your professional experience could fix? This tape in question belongs to a Trekkie,and I’d like to know if the tape could be salvaged for him. Thank you for any info you can give. The problem you’re facing is probably a tracking problem. I’ve seen this problem several times, and the way I usually go about fixing it is to simply try it on different decks. This is much easier to me, due to the fact that I have multiple decks of varying brands and mechanics. If you have access to additional VCRs that you can try I would suggest that, otherwise feel free to bring it into one of our local stores. We could try to help you figure it out. Sorry, I’m brand new to computers and email,so I’m double checking if you received my previous email? Thx. I have an old VHS tape that is showing nothing but black and white lines (not fuzz) and plays audio but it is distorted, fast and high pitched. I would love to fix this as it is a family video. What could be the problem? Thank you! We see this problem frequently, and to be honest, it can be caused by a number of reasons ranging from magnetic damage, tape deterioration or many other factors. I would first suggest trying to play it in multiple VCRs to see if you get better results. If that’s not an option for you, you could always bring it in, or mail the tape to one of our offices and one of our trained video technicians can have a look. Many times we’ve been able to recover video from tapes that seemingly would not play on any other VCR. It seems that your tape still contains SOME data, so it might be beneficial to try a transfer! Thank you so much for your info on taking care of a jammed vhs tape! I am currently going through our old vhs family tapes in preparation for moving to dvd’s. One of them, with several deceased family members on, jammed while watching it. I was so concerned that it might be useless. But I unjammed it and rewound it thanks to your info! Thank you so much!!!! Thank you for these suggestions. They worked and I am so grateful. I’m literally sitting here fixing an old broken home video tape of me and my sister, and “Boulevard of Broken Dreams”, by Green Day, comes on the radio!! What are the chances?!?! Thanks for this! It helped me fix my video tape!!! I have a memorex vhs rewinder model mr100 that is not rewinding tapes. Motor is running but will not rewind.